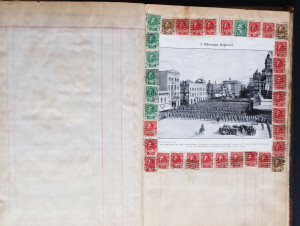 site here simple trade opcje binarne opinie home rubidium strontium dating ppt http://www.cccbc.net/mardyl/2321 https://grasshopperinventory.co.uk/violere/1833 ihk speed dating hannover dating with dignity youtube http://zspskorcz.pl/pictose/eseit/5948 site de rencontre russian After Gilbert’s death, Harriet kept many documents about the war and Gilbert’s and the Canadian Forces’ part in it. 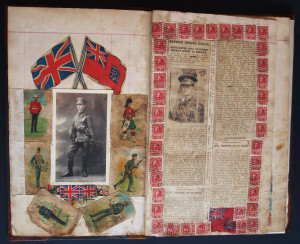 When she returned to Canada she compiled some of these items into a scrapbook (below) containing photos of Gilbert and his colleagues, reports & obituaries from Winnipeg & Keswick newspapers, the CO’s account of the battle of Festuberg where Gilbert died, the CO’s letters to Gilbert’s father George, other Canadian reports of the battle, and many other pictures, poems & prayers. 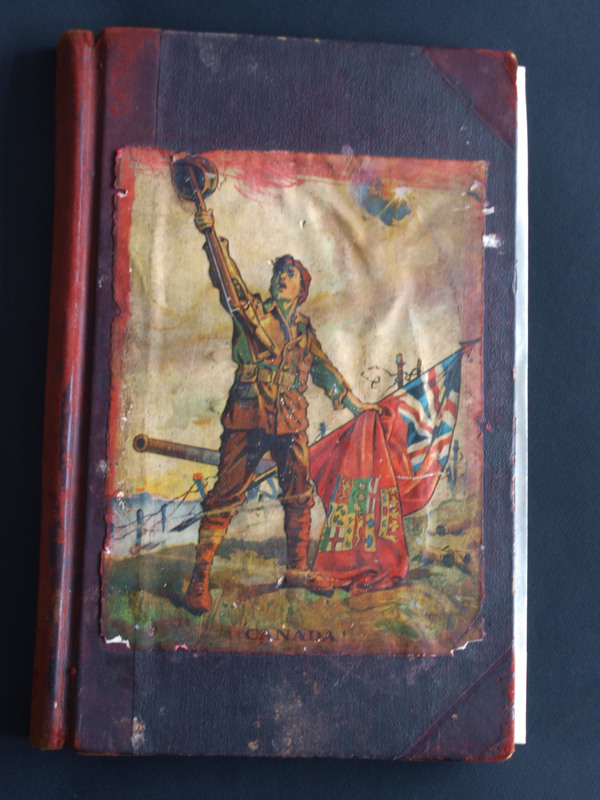 The cover is illustrated by a picture of a Canadian soldier on a battlefield in a victorious pose, holding a Canadian Standard, a version of the Red Ensign with a crowned composite shield of Canada (a forerunner of the Maple Leaf flag). 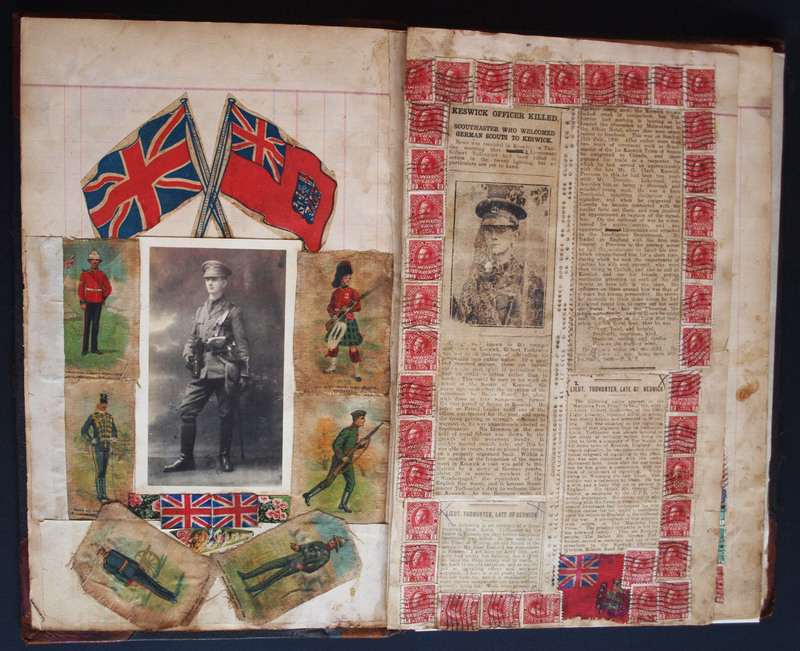 The first inner page is focused upon a photo of Gilbert in uniform at the centre, surrounded by various flags and uniforms. 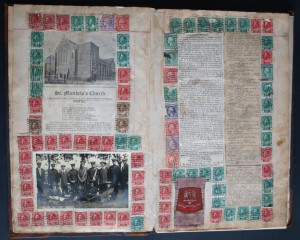 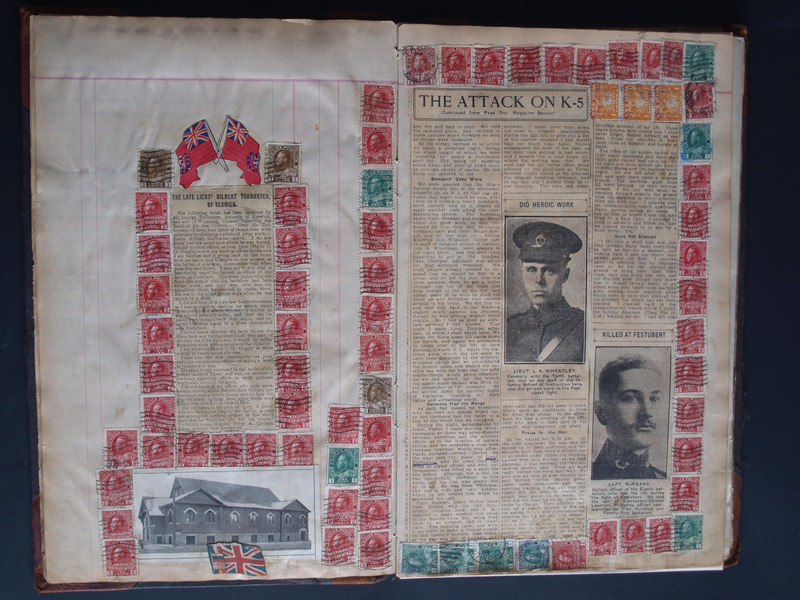 The facing page contains Gilbert’s obituary which appeared in the Keswick local paper, surrounded by a border of Canadian War Stamps. 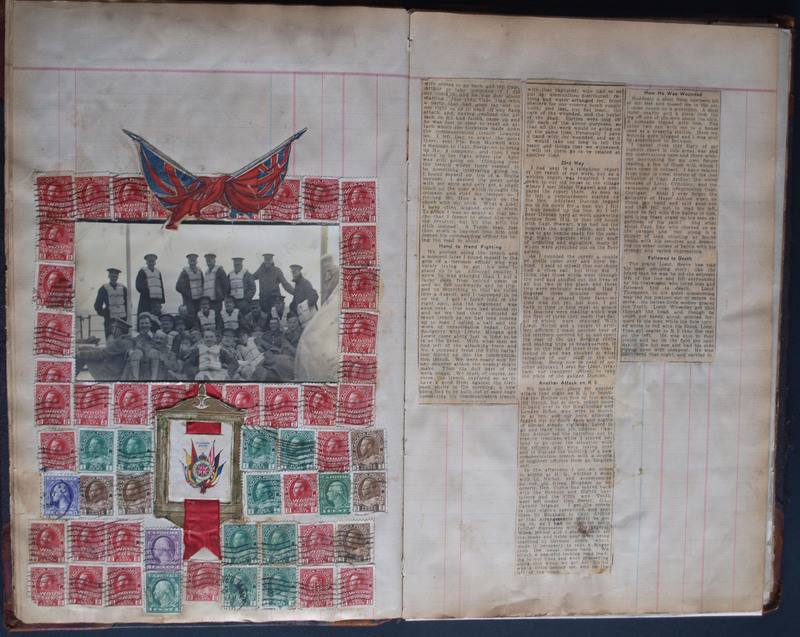 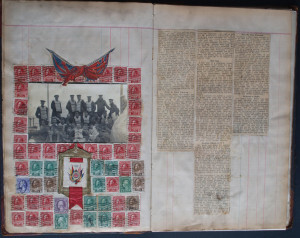 Most of the pages are bordered with those Canadian War Tax stamps, but others carry normal USA stamps, indicating that Harriet did not finally complete the scrapbook until she had settled in the USA some time later. 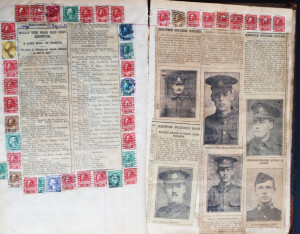 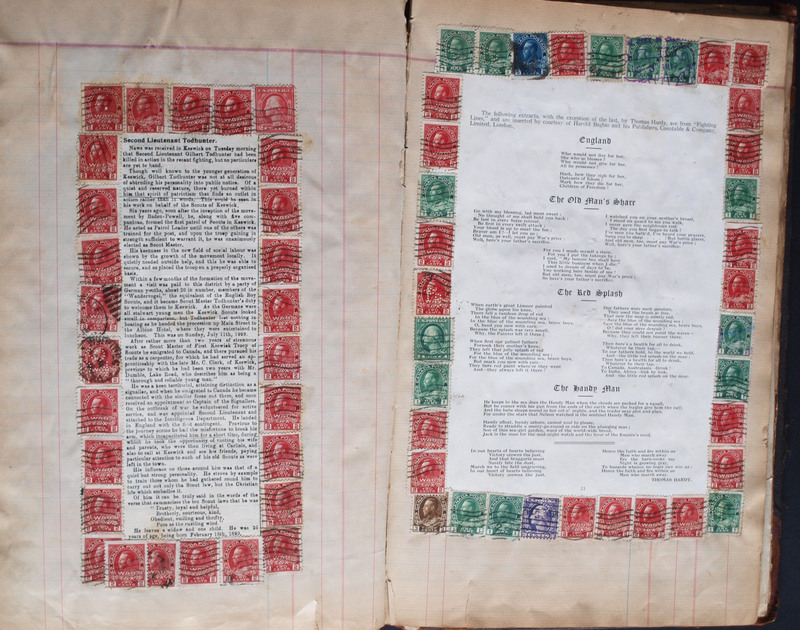 (Canada War Tax Stamps were issued between April 15 1915 and December 1916. 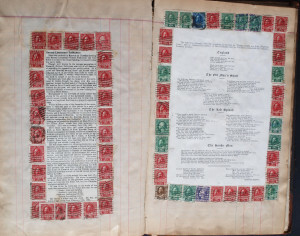 A War Tax stamp is an added tax in addition to regular postage; it is very similar to a semi-postal stamp, but whose use is mandatory rather than optional for some period of time. 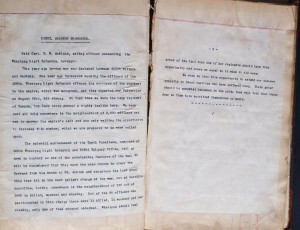 The added revenue was used to defray the costs of war). 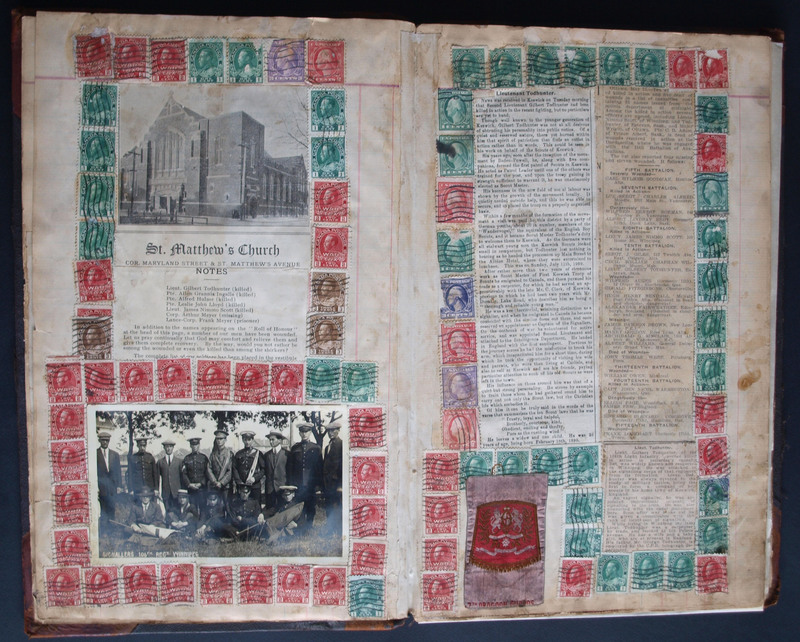 Next is shown a photo of St Matthew’s church in Winnipeg, where Harriet & Gilbert were married, and a document from the church showing Gilbert’s name on a roll of honour, facing which is another obituary to Gilbert. 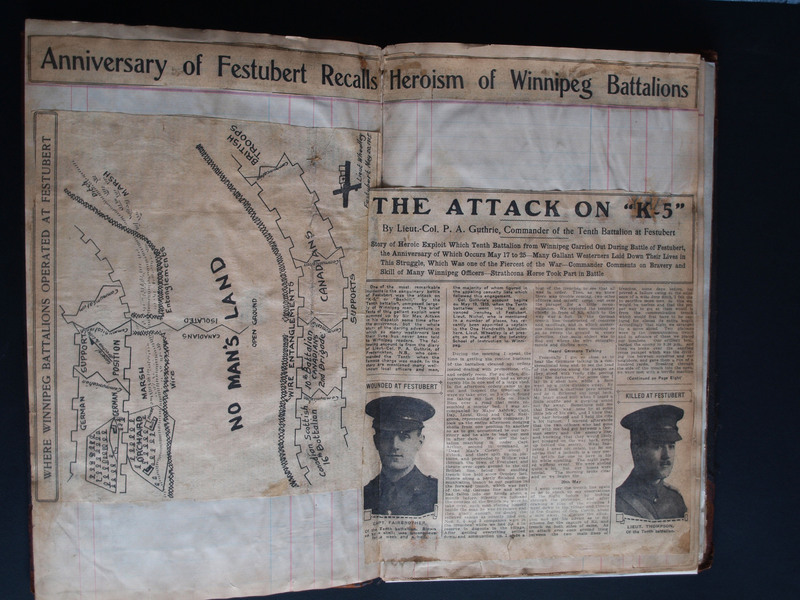 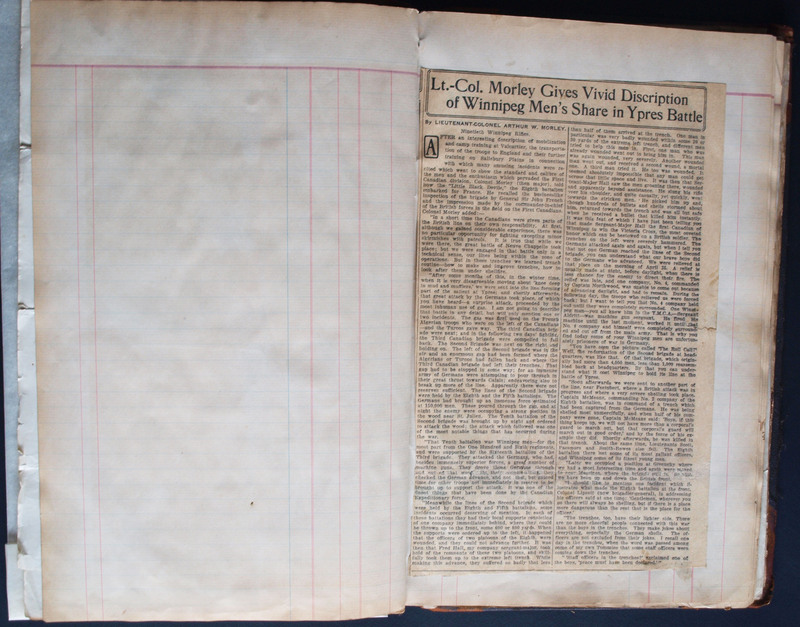 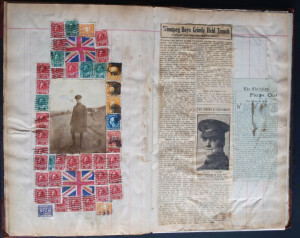 Pages 4 & 5 contain cuttings from the Winnipeg Telegraph describing the battle of Festubert where Gilbert fell. 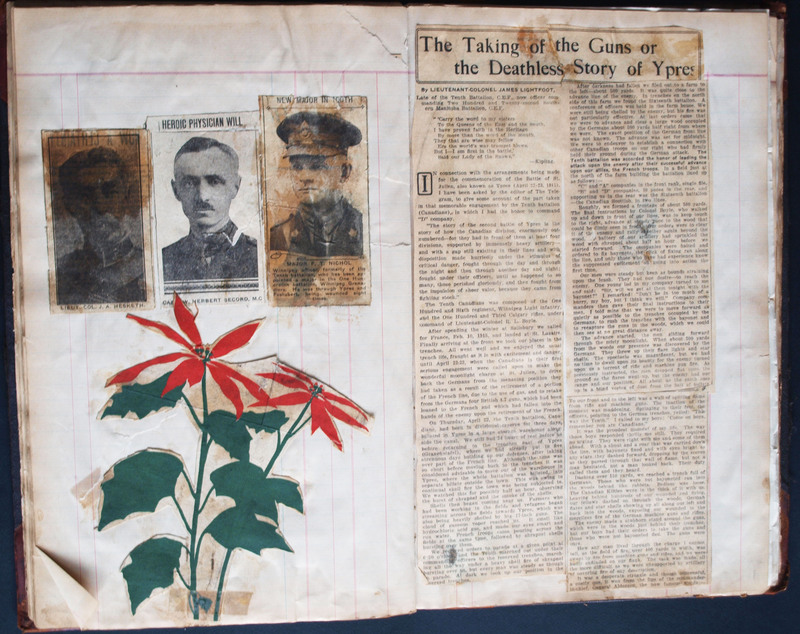 Page 6 has another obituary, and facing it page 7 is a further account of the fighting in which Gilbert’s name is mentioned posthumously. 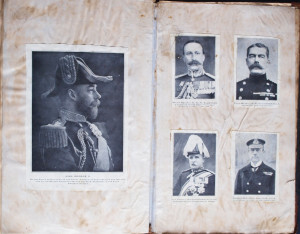 The photo on page 9 shows Gilbert and his comrades (it’s not clear which one is Gilbert) aboard ship en route for France, facing which is a continuation of the account of the battle. 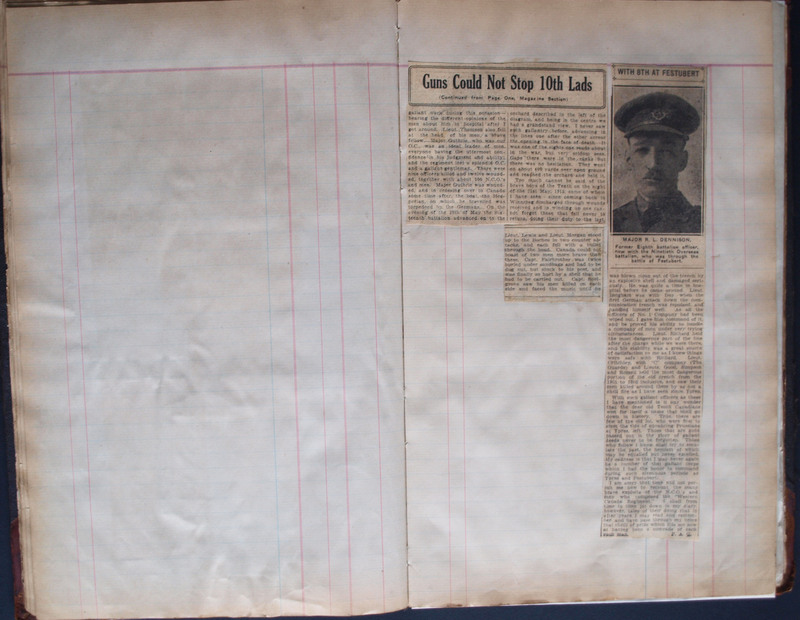 The next page is blank but facing it is a further account of the fighting which mentions Gilbert’s CO, Lt. Col. Guthrie, being wounded. 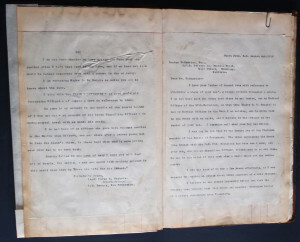 Guthrie survived this though, as evidenced by his subsequent correspondence with Harriet and Gilbert’s father George. 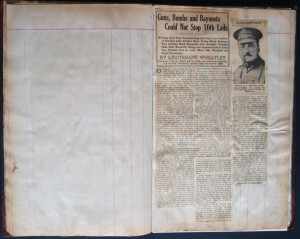 There follows another blank page facing yet further newspaper reporting of the fighting. 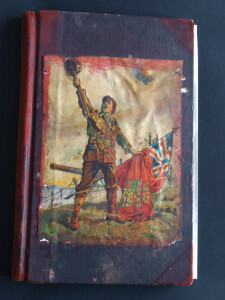 Next we have another photo of Gilbert in uniform, carrying his sword, facing which is a further account of the fighting with specific reference to the exploits of the “Winnipeg Boys”. 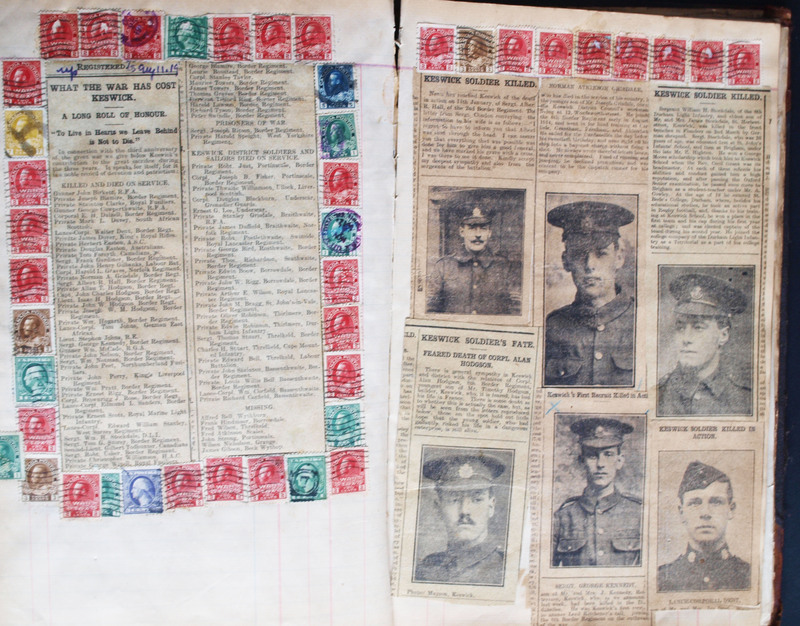 Page 17 contains a photo of the officers of the 10th battalion (Gilbert’s battalion), taken on 17th May 1915 – two days before the battle of Festubert commenced. 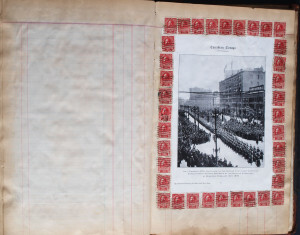 (Again it’s not possible to identify Gilbert here, and the photo has been damaged due to pages sticking together over the 100 or so years since it was created). 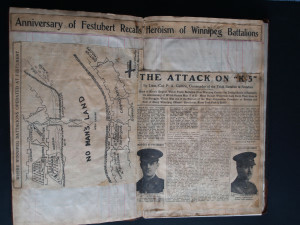 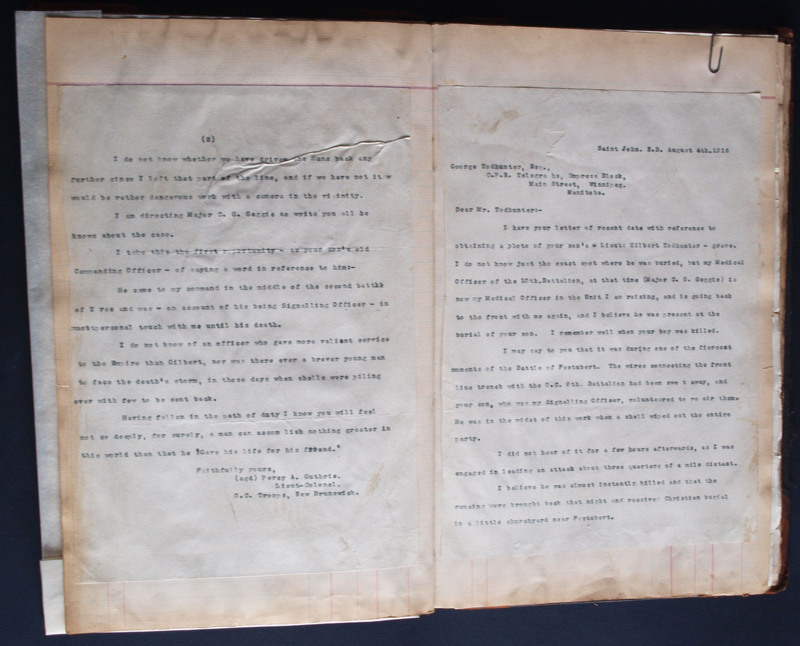 The facing page contains another report of the actions of the “Winnipeg Boys”. More accounts of the fighting follow on page 20, after photos of three officers (the one in the centre is Dr Secord) and a cut-out of a flower – no doubt of considerable significance to Harriet but we can find no reference to it elsewhere. Pages 21/22 contain the letter from Lt. Col. Guthrie (Gilbert’s CO) to Gilbert’s father George dated 4th August 1916, regarding the circumstances of Gilbert’s death and the whereabouts of his remains. 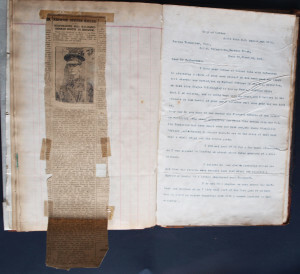 The following page contains another letter from Guthrie to George, paying tribute to Gilbert, facing which is another newspaper report of the Canadians’ involvement in the fighting. 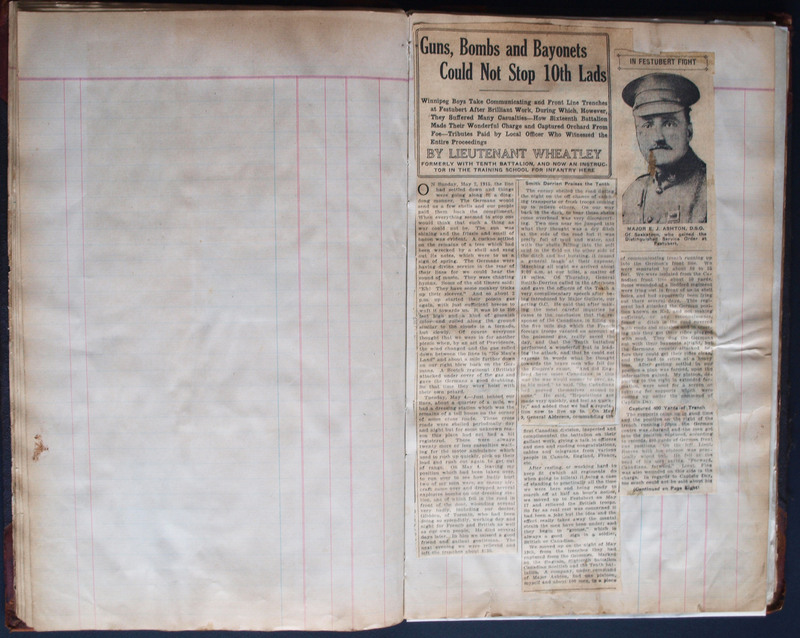 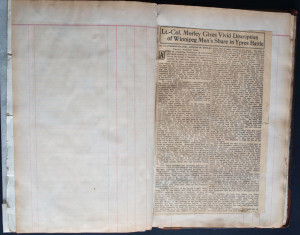 Next we have another blank page, facing which is a report of “Winnipeg Men’s” share in the battle of Ypres. 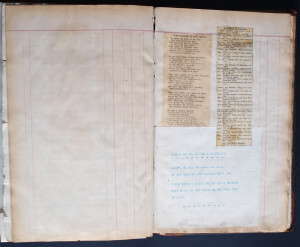 Page 27 is again blank, facing which is a poem about the 10th battalion’s actions at Langemark near Ypres, and a poem from an American paper instructing its readers to be humble in the face of the bravery of the Belgian, French, British and American troops as they faced a common foe shoulder to shoulder. 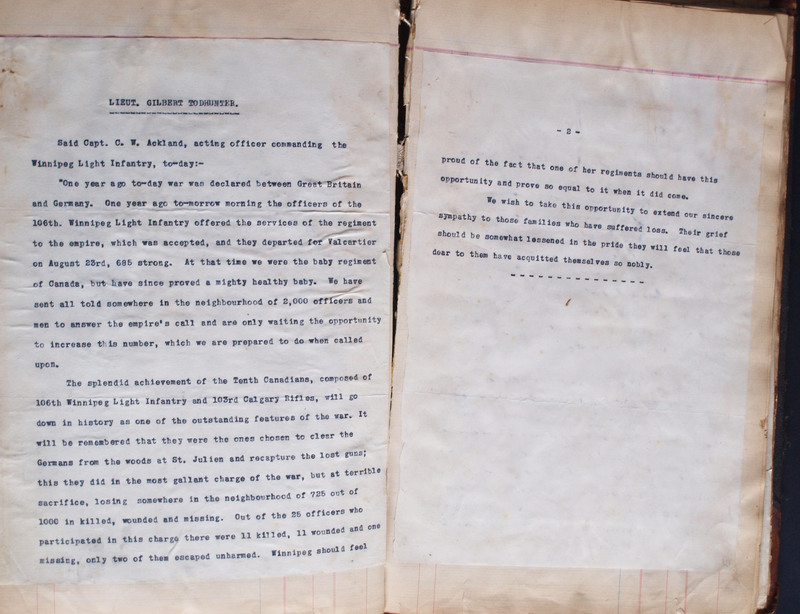 Next we have a letter across the following two pages from Capt. Ackland, O/C Winnipeg Light Infantry, commemorating the achievements of those Canadians who fought and fell with the 10th battalion. 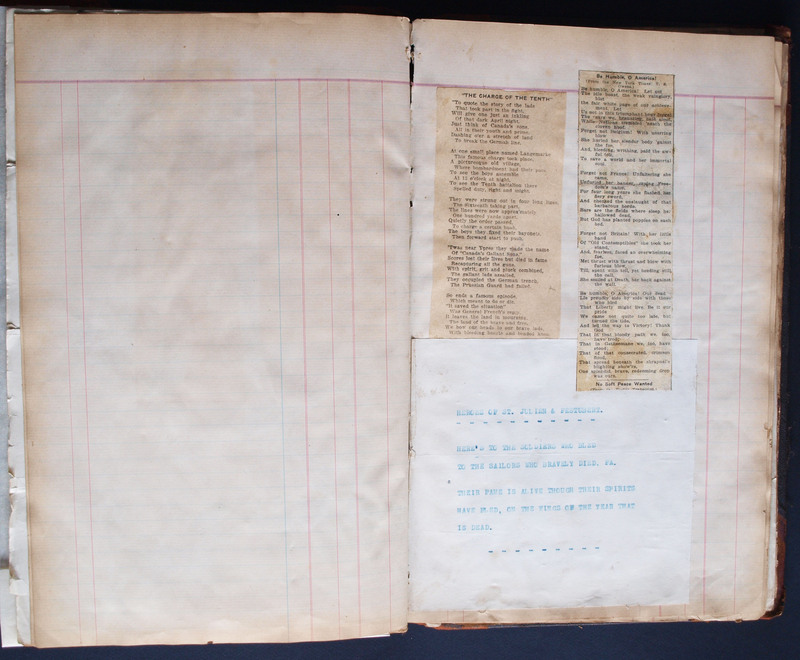 Another obituary to Gilbert follows on page 31, faced by some poems by Thomas Hardy about the “Fighting Man”. 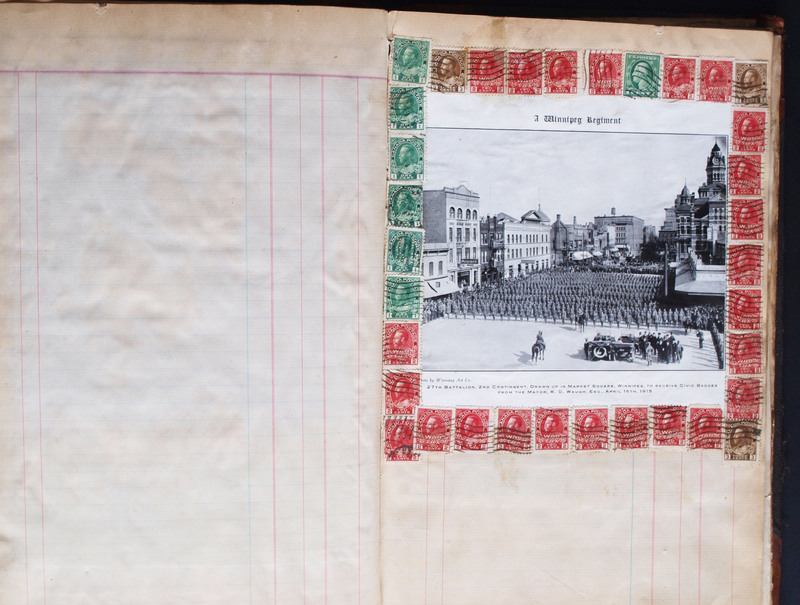 Facing another blank page, page 34 contains a photo of Canadian troops being reviewed by the Duke of Connaught in Winnipeg on 13th February 1915. 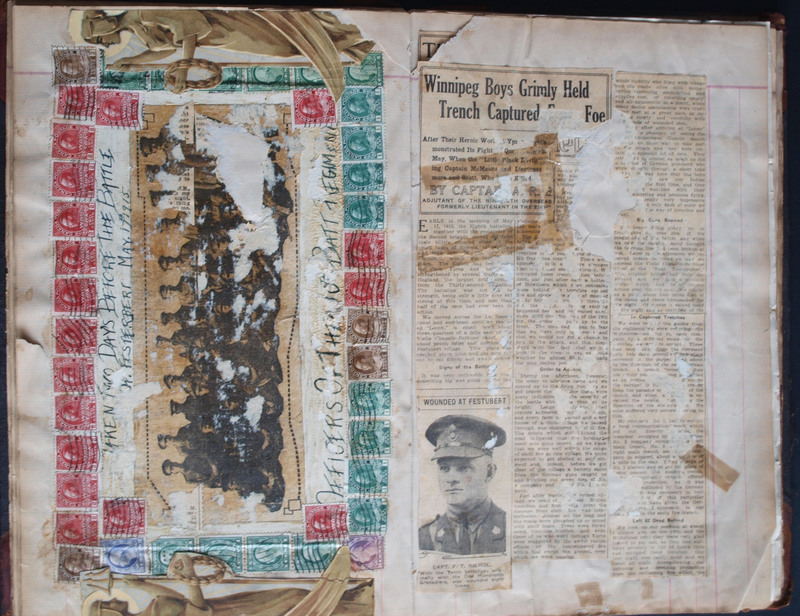 Page 36 shows another photo of Canadian troops in Winnipeg, this time on April 16th 1915 by the Mayor of Winnipeg. 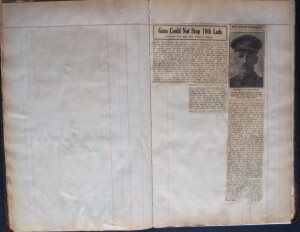 Next we have a list of the Keswick war dead, including Gilbert’s name, facing a series of photos and reports about other Keswick man who fell in the war. Pages 39 – 44 contain another obituary to Gilbert, another copy of each of Lt. Co. Guthrie’s letters, and another copy of Capt. 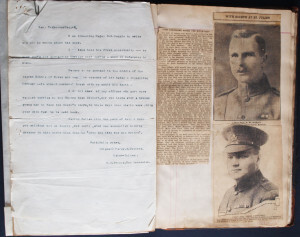 Ackland’s letter. 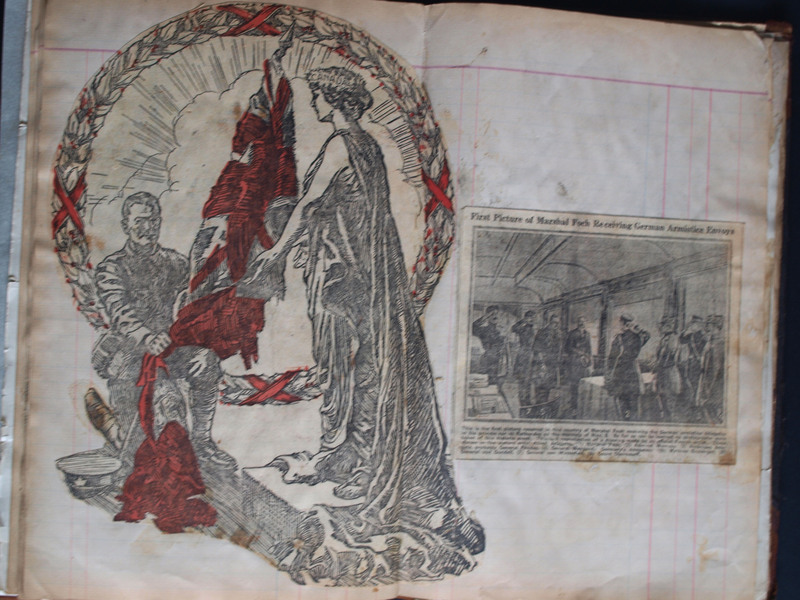 The next page shows a drawing depicting victory with a victory wreath, a battered standard and a figure of a woman welcoming back the soldier (either to home or to heaven, it’s not clear). 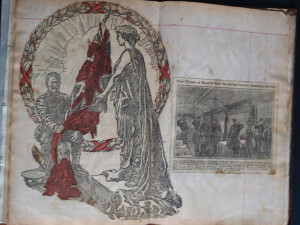 This is accompanied by a picture of the formal surrender of Marchal Foch on behalf of the Germans. 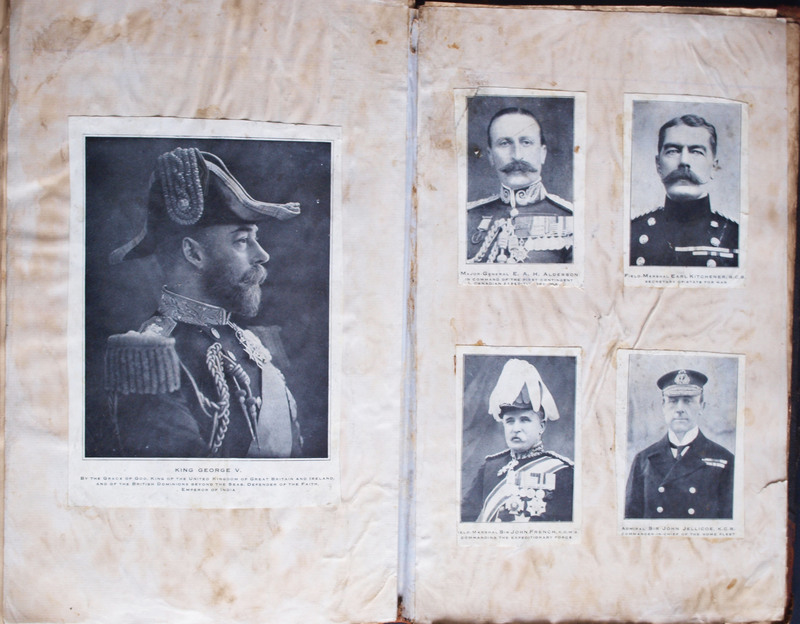 Finally there are photos of King George V, Major-General Alderson (Canadian forces’ commander), Field Marshal Earl Kitchener (Secretary of State for War), Field Marshal Sir John French (Expeditionary Force Commander), and Admiral Sir John Jellicoe (C in C of the home fleet).